The system works both as a web-based computer application and as a mobile application for Android phones (downloadable from Google Play). Any registered user can report findings of alien species in Slovenia. There are separate entries for all species from the watchlist and from the alert list. There is also a possibility to upload findings of unidentified alien species, after which experts help to identify the species on basis of uploaded photographs. All observations should be accompanied by a photograph (in the mobile phone application, it is possible to use the camera of the phone for this). This enables verification of the data by experts, who then provide feedback about the identification to the user. Verified data are displayed on maps which are publicly accessible also for non-registered users. The Invazivke system is designed for the use by both experts and lay naturalists, including forest owners, nature lovers, hikers and others who care about nature. In many countries, public involvement in data collection has proven to be a key factor in surveying and monitoring alien species. This is not surprising, because in the early stages of establishment and spread of alien species, the number of individuals is low and a large network of observers is needed to record them. Additionally, newly established alien species often spread first in and from urban environments, which are often outside of areas where biodiversity is monitored and researched. At the same time, local inhabitants often notice changes when new species become established. 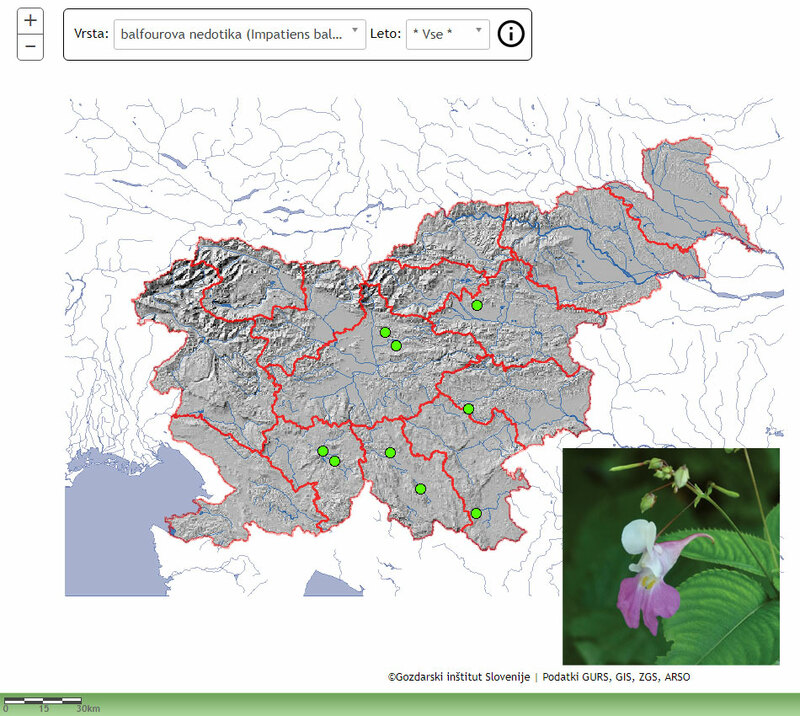 Map of the observations of Balfour's touch-me-not, which are uploaded in the application Invazivke in 2017. How does Information system "Invazivke" work?